I’m sure that there were some collectors who were aware of this, but it sure caught me and most collectors by surprise! 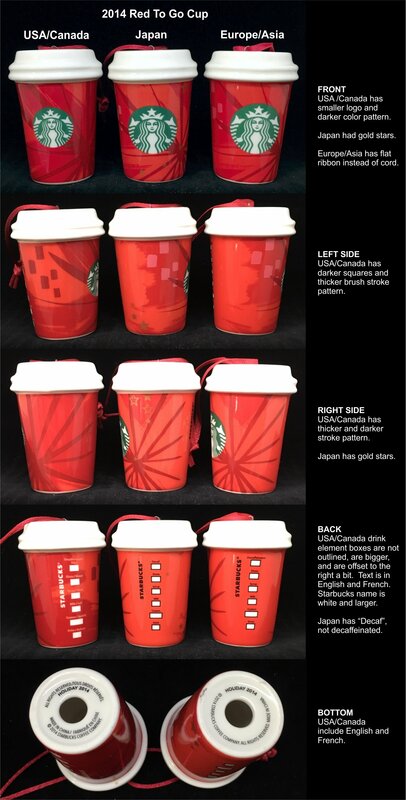 Until January 2016 most of us had no idea that Starbucks had released THREE versions of the Red To Go Cup in 2014. Most of us were slightly aware of only two. Japan continued to have a unique version to themselves along with a second ornament based on the white cup with a red starburst pattern added. But Starbucks also released one in Europe and Asia as well. The difference between the Japan and Europe/Asia versions is minor so most people didn’t catch that it was in fact a different version. The North American version has significant differences as you can see in the side-by-side image below. Most notably is smaller logo and the inclusion of French for the French-Canadian market. But the color scheme and accents are a bit darker as well. The main difference between the Japan and Europe/Asia versions are the little gold stars. As noted in an earlier post, why the separate releases are made is unknown. But it certainly keeps us collectors on our toes.